Liam’s birthday is only a couple of weeks after mine so we tend to celebrate our birthdays together. When I say ‘celebrate’ I don’t mean razzmatazz, wild parties, clubbing or jetting over to Paris for a romantic city break. We’ve neither the energy nor the readies these days. No, a nice meal and good conversation washed down by a bottle or two is now the order of the day. Recently, an Ivy Brasserie opened here in old Norwich town. The original Ivy Restaurant is in Covent Garden in Central London and has been serving up posh nosh to the rich and infamous for a hundred years. Back in the day, I was lucky enough to have the readies to lunch there a few times. Although pricey, the food was (and probably still is) amazing. Keen to cash in on the brand, Ivy Brasseries have started popping up all over the best places. The classic has become a chain. So we decided to treat ourselves and give it a whirl. Was it worth it? Absolutely – lavish decor, relaxed atmosphere, exemplary service, flirtatious waiter, great food. And autumnal skies gave way to bright, warm sunshine – no jacket required. What’s not to like? I’ve always said that a meal without good company is just food. And with Liam, I’m always in the best company whether it’s at a fancy bistro or sharing a bag of chips on the way home from the pub. It’s my habit to pop out for a mid-morning coffee following the torture at the gym. One sunny day I parked myself outside a café to rest my weary bones, sip my americano, scan my newspaper and watch the ebb and flow of the eclectic crowd. A sallow-faced, reedy man plonked himself down in front of me. He was playing Rick Astley’s ‘Never Gonna Give You Up’ on his phone – not too loud to cause a stir but loud enough to raise eyebrows. A silver-haired old chap with a walking stick shuffled past. ‘Like the music?’ he asked. 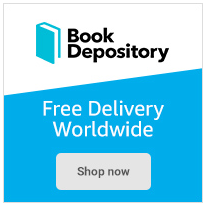 ‘Some Pet Shop Boys would be nicer,’ he said with a wink. I tend to agree. And so to the Pet Shop Boys anthem which was the soundtrack to many a young man’s coming out back in the day. Little ol’ Norwich has been voted as one of the top twelve places to live in the UK according to the Sunday Times (as reported in our local rag, The Norwich Evening News). 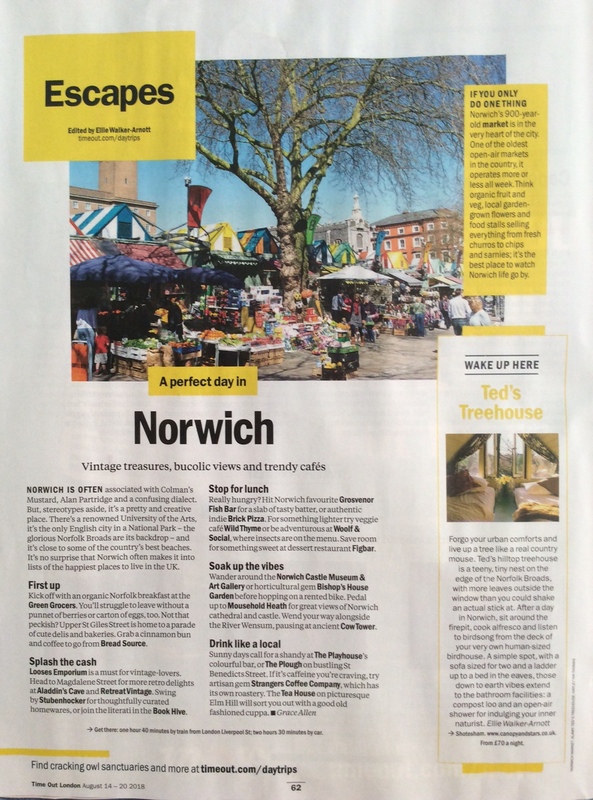 And then Time Out London did a full page spread praising Norwich as one of the happiest cities in the realm. The magazine recommends a few places we know well – The Grosvenor Fish Bar (voted as one of the best chippies anywhere), Wild Thyme for the veggies (but sadly out of action right now due to an inconvenient fire), The Plough (prettiest beer garden in the city), The Playhouse Bar (for an arty student vibe) and Strangers Coffee House (they have their own roastery). I could’ve written the piece myself. So why are we thinking about laying our cloth cap in God’s Own Country when the time is right? Well, we like it Oop North and, as we shuffle towards our twilight years, it pays to be on the right side of God. Just in case. Time Out page courtesy of – you know who you are! Along Norwich’s hare course of fifty or so multi-coloured leporids, there are supposed to be over 160 leverets nesting in shop windows or larking about in gay abandon outside doorways. That’s what young hares are called, apparently. Well, I’ve only noticed a few here and there. So where are the other 129? I did, however, stumble across a drove of ten of the little blighters in a department store ready to pounce from the long grass and play havoc at the Clarins counter. The whole oversized-creatures-in-the-street theme for charity is getting out of hand. Now Manchester’s doing it with their Bee in the City trail. 101 giant, brightly-coloured worker bees can be seen buzzing about the city all summer. Bee image courtesy of Manchester Evening News. 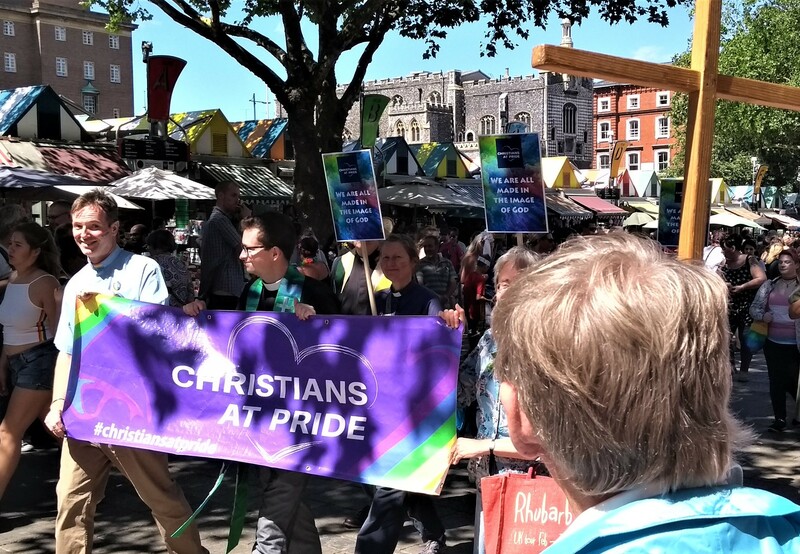 Norwich Pride has come of age with a huge rainbow flourish as sparkling as the weather. A marcher held up a placard that read ‘The First Pride was a Riot’ – a nod to the 1969 Stonewall riots in New York. This year’s march was led by the Norfolk Fire and Rescue Service, the pride organisers, coppers sporting rainbow epaulettes and the Lord Mayor waving a rainbow flag. We’ve come a long way. A lone dissenter held up a large cross and urged the crowd to repent. Onward Christian soldiers smiled at him benignly as they passed by. Young and old marched together. An older guy caught my eye. He was riding a mobility scooter emblazoned with pride motifs and sipping a glass of white wine. Now that’s the way to travel. The loud and proud procession took about an hour to pass and was brought up the rear by an enormous rainbow ‘river’ held aloft by revellers. Pride in the park was packed with a rainbow of people of every gender, size, age, persuasion, ability and garb. We roamed about soaking up the merriment and watched a few of the acts doing their thing on the main stage. When the youthful crowd started singing along to a cover version of S Club 7’s ‘Reach’, my heart melted. A young lady emerged from the audience and asked us if we were gay. She couldn’t have been more than 16. “Yes”, we replied. “I’m so proud of you,” she said. “I’ve just come out”. We hugged and wished her well. It made me cry with pride. A celebration of the LGBT community for everyone.